A Boeing plane has broken the record for the longest non-stop passenger airline flight, after a 12,500-mile trip from Hong Kong to London. The 777-200LR Worldliner jet landed at Heathrow Airport just after 1300 GMT, some 25 minutes ahead of schedule, and 23 hours after the start of the flight. The flight was central to Boeing's belief that the future of flying lies in point-to-point long-haul flights. Its arch-rival Airbus believes in flights between hub airports. The plane's journey, which in kilometers was more than 20,000km, took it east across the Pacific, then over the US and onto the Atlantic. It was crewed by four pilots and was carrying 35 passengers and crew, including Boeing representatives, journalists and airline executives. Boeing has now beaten its previous world record for the longest non-stop commercial airline flight, which was set in 1989 by a 747-400 jumbo jet flying 10,500 miles from London to Sydney. The airline hopes its latest record success will encourage airlines to offer non-stop flights across the world, saving fuel and time spent on stopovers. It is facing fierce competition from European manufacturer Airbus, which earlier this year launched its A380 double-decker passenger jet with the aim of capturing the long-haul market. 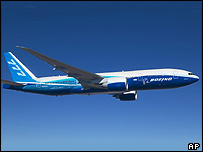 The Boeing 777-200LR competes directly with the widely-used Airbus A340-500, which has a flight range of 10,380 miles. Due to come into service next year with Pakistan International Airlines, it will be able to carry 301 passengers. Qatar Airways, Air India and Taiwanese carrier EVA Air have also announced orders. The plane uses lighter composite materials to improve range and fuel efficiency.